Following the analysis of the neighbourhoods and architectural style specific to the city of Sibiu, a concept for the new complex was set out to raise the potential of the area. 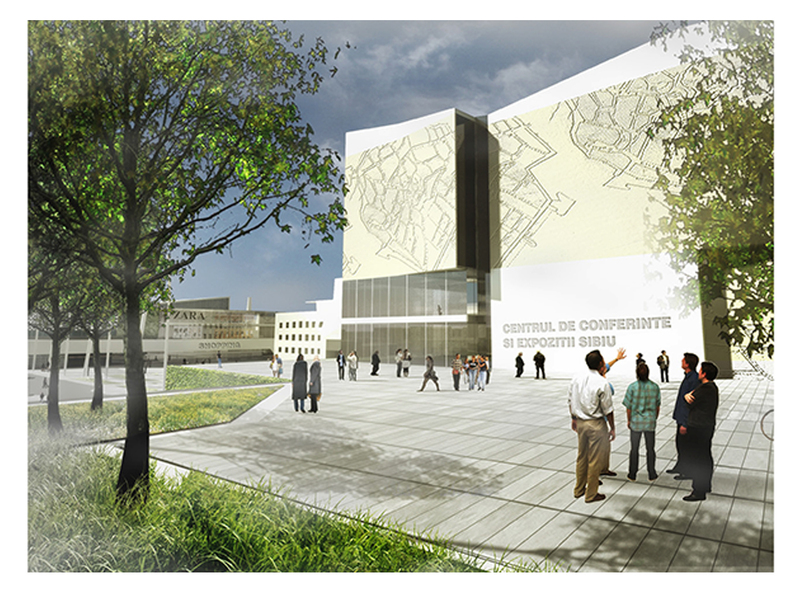 The existing built-up area, the immediate vicinity of the Historic Center, the street tram and the proposed building destination, are elements which were considered in the implementation of the Center. The new complex consists of a theater, hotel, commercial center and cinema, commercial spaces and offices, the info point for tourists with coffee shop, exhibition and conference center and also 470 parking places in a 4-storey underground garage. Both the authorities and the residents noticed the problem of this abandoned and unexplored area and wanted a revitalization and a cosmeticisation that would bring the area’s potential all the time and would be a center of interest for the community and tourists. The initial goal was to create a conference space to provide accommodation and offices and continuous exploitation. The necessity of these spaces has created the opportunity to develop the entire public space and create commercial and loisir spaces both for residents and for tourists. 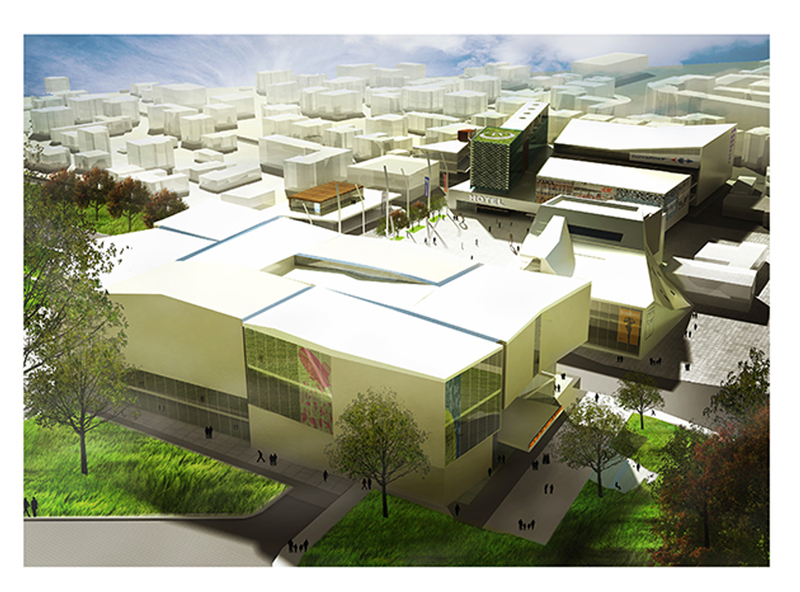 Following the analysis of the neighborhoods and the architectural style specific to the city of Sibiu, a concept for the new complex was set out to raise the potential of the area. 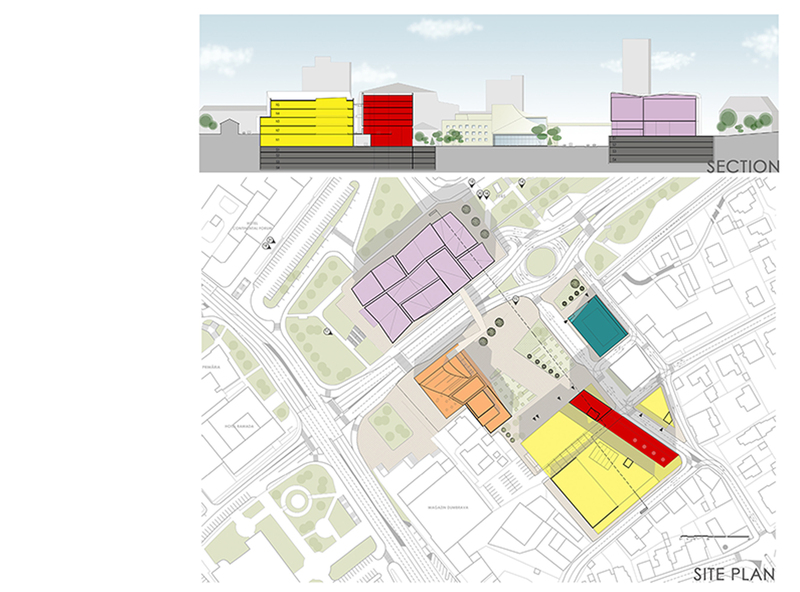 The existing built-up area, the immediate vicinity of the Historic Center, the street tram and the proposed building destination, are elements which were considered in the implementation of the Center. 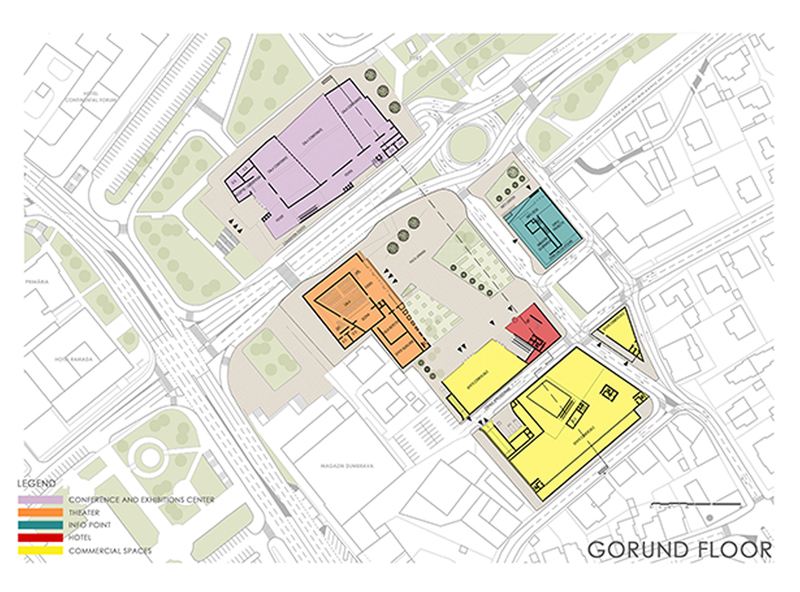 The new complex consists of a theater, hotel, commercial center and cinema, commercial spaces and offices, the info point for turists with coffe shop, exhibition and conference center and also 470 parking places in a 4-storey underground garage. The proposed assembly started from the plot of 7.645 sqm, but the analysis of the entire complex has expanded so that coordination and integration of the existing neighborhoods can be achieved. The study expanded beyond Corneliu Coposu Boulevard on the former lot of the 90 Barrack which was demolished in 1986 and where the proposed Conference and Exhibition Center was thought as a symbol building for the city of Sibiu. Referral to the past history is done visually, by fingerprinting the building with the image of the old town map. At the same time, considering the street tram and the morphology of an urban batch of the old part of the city, it was desired to create a “fractured” volumetry that would fit into the existing and appear less intrusive. The “bright alleys” bring daylight to the interior spaces. They also recall the picturesque passages of old Sibiu. The volume of the theater evokes the silhouette of the roofs from the old town. Entrance from the bridge connecting the Convention Center, is done at the upper level through a similar opening with that of the old skylights. The Turist Information Center, whose shape symbolizez a book that opens, can accommodate various functions which differ from season to season. In the whole market is distinguished as a core of information, orientation and cultural distribution.